Every spring, my husband Steve and I set aside a few days for a work retreat. We’re both music freelancers, so this is a time for us to take a step back from our businesses, reflect on the successes and challenges of the past year, evaluate what’s going well and what could be improved, and do some creative planning for the year ahead. Often, we try to tie this in with a short getaway (because by March or April, we usually have a pretty bad case of cabin fever). In the past, we’ve found affordable rentals on Airbnb (a business expense!) within an hour’s drive and bring our dog Rory, our laptops, a few books, and food and snacks for a few days. This year, we’re doing things a little differently and dividing our retreat into three Saturday sessions at our local conservatory. We bring our notes, blank paper, and coffee and find a bench in a quiet corner of one room to sit and have conversation. Regardless of when and where our work retreat takes place, it’s always a helpful way for me to get perspective, dream big, and make decisions in my business. First, think about whether you’d like your work retreat to be solo or collaborative. As I mentioned above, because Steve and I are both music freelancers, we plan a collaborative work retreat each year. We take turns sharing about our businesses and listening, asking for advice and strategizing, coming up with ideas and offering support. Have a friend who’s a music freelancer? Consider asking them to join you for a few sessions to talk about your businesses and brainstorm. Prefer to work solo? Set aside a day or two on your calendar for some deep work. Next, decide whether you’ll travel somewhere for your work retreat, set up shop locally, or stay home. If you’re able to get away for a few days, I recommend it, as it can be a helpful way to clear your head, focus, and get good work done. That being said, this is absolutely not necessary to the process. Make a plan and start writing out a schedule of how you’ll use your time. As you can see, we have three primary components for our work retreat each year: reflection, strategy sessions, and independent work. We always start our retreats with reflection: a time to look back on the past 12 months and evaluate what worked well, what didn’t work, challenges we faced, good things that happened, and things we’re celebrating. Often, we’ll do this in the car on the way to our destination, depending on how far we’re going. This year, because we stayed home, we did the reflection piece at the beginning of the year when we set goals (during a long car trip) and gave a quick recap of these things at the beginning of our first strategy session. We start each strategy session with a full cup of coffee, a page of notes, and a few sheets of blank paper. These sessions are for deep-diving into whatever topics we’d like to talk about in our businesses, asking questions, brainstorming ideas, and getting feedback. We put our phones in airplane mode and do our strategy sessions without being connected to the internet. Instead, we take turns helping the other person talk through, strategize, and sketch out new ideas without getting sidetracked by notifications or stopping to look things up. Often, the strategy sessions will give us lots of new ideas to research, study, and think through. Building in some time for independent work is an important way to take action on some of things we discussed - doing research, evaluating new tools and software, writing email template drafts, or getting a head start on outlining a new project. I’ve found this time to be a valuable step in helping us make progress in our next strategy session. The reflecting and strategizing and questioning and creating you do during a work retreat is hard work. The strategy sessions are intense and focused and require a lot of energy and deep thinking. So, do yourself a favor and plan a few small ways to reward yourself throughout the process. If we’re traveling, we usually plan to celebrate one night with dinner out somewhere close by. Or, we take a hike after lunch somewhere we haven’t been before. This is a good way to build in a mental break, because you can’t do this kind of deep, focused work all day, every day. Doing something to clear your head will often help bring you clarity and a fresh perspective when you return to your work later on. We try to pick up a few snacks we don’t normally have to get us through the afternoon sessions, and if we’re staying close to home, we might pick up coffee from a local place one day as a special treat. We find having a few small things to look forward to helps us work hard and stay focused on the task at hand. Now that you have the details of your work retreat sketched out, it’s time to do some prep work. In the weeks leading up to our work retreat, Steve and I set aside some time on our own to evaluate our businesses and create an outline of things we’d like to talk about: questions we have, things we want to strategize or develop, places where we want to ask for feedback or advice, big ideas for new projects, etc. This helps guide our conversation in the strategy sessions and inform where we spend our time and energy. Steve and I both do multiple things (e.g. teaching, administrative work, writing/creating), so we usually find it helpful to focus on one aspect of our business in each strategy session. This helps us become fully-immersed in that work, those challenges, those new ideas, instead of task-switching and jumping between different projects and different types of work in the same 60-90 minute session. 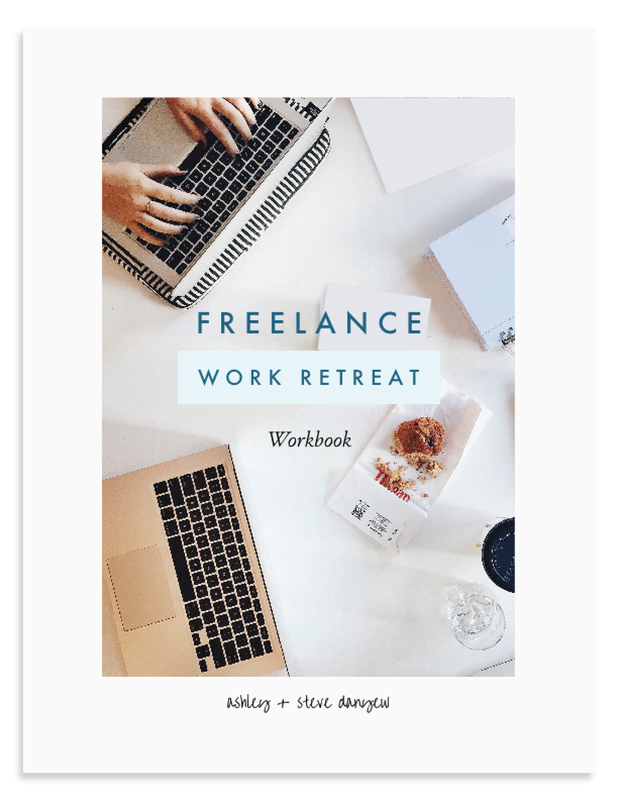 Do you do a work retreat for your freelance business? What does it look like? Leave a comment below and let us know. We’d love to hear about your process! 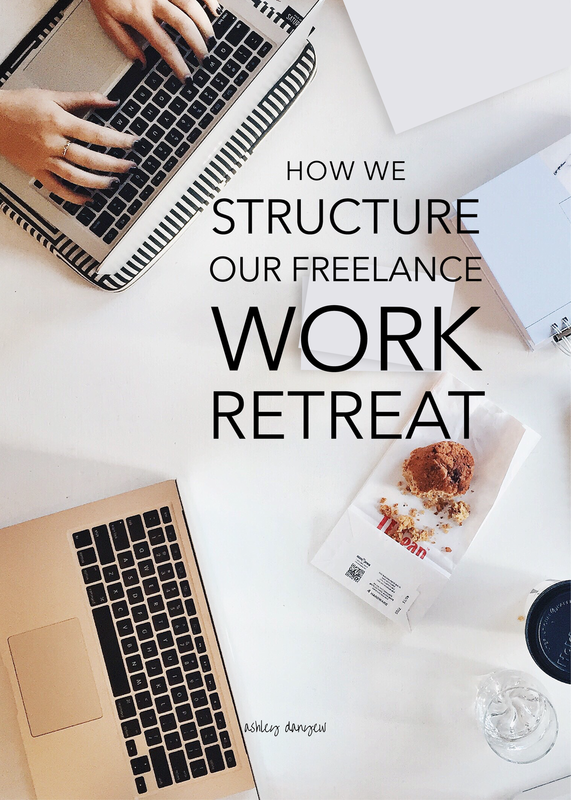 Preparing for your own work retreat?